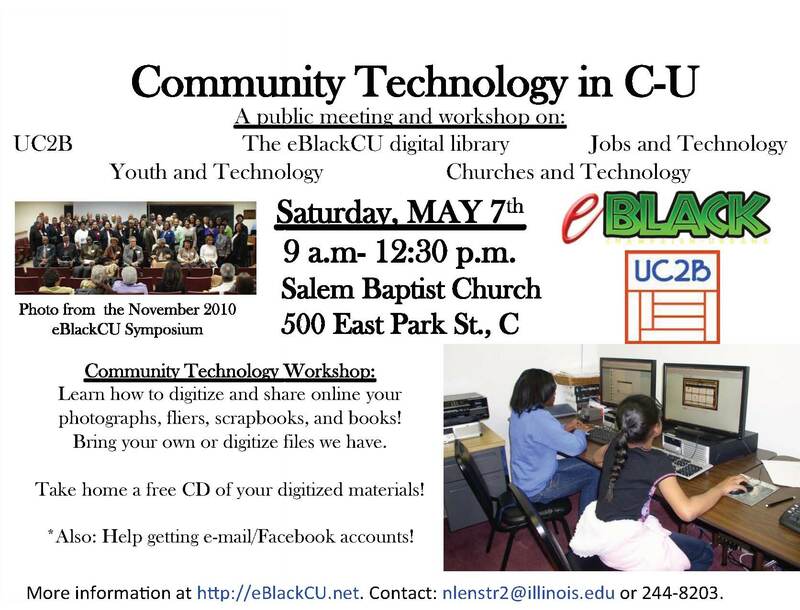 Saturday MAY 7th, 2011 9 a.m- 12:30 p.m. Salem Baptist Church 500 East Park Street Champaign IL A public meeting on: UC2B The eBlackCU digital library Jobs and Technology Youth and Technology Churches and Technology Plus Community Technology Workshop: Learn how to digitize and share online your photographs, fliers, scrapbooks, and books! Bring your own or digitize files we have. Take home a free CD of your digitized materials! *Also: Help getting e-mail/Facebook accounts! More information at http://eBlackCU.net. Contact: nlenstr2@illinois.edu or 244-8203. Over 450 people in Champaign-Urbana have attended Public Forums on Digital Technology, Digital Education, Digital Community and Digital Jobs. This event continues this momentum. We need all voices and all backgrounds to mobilize to change our community for the better. YOU are invited to come and share what you and your community groups do with technology, what you have thought about doing with technology, what obstacles you face, and some solutions you have come up with. Our goals are articulated in the Community Technology Manifesto: http://eblackcu.net/portal/manifesto, which EVERYONE is invited to sign. 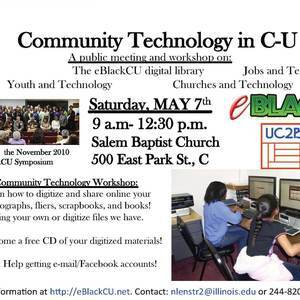 This event will feature discussion and updates on: the eBlackCU Digital Library of local African-American History and Culture, Jobs and Technology, Youth and Technology, Churches and Technology, and UC2B Big Broadband Network. This event will be broadcast LIVE around the world at: http://www.ustream.tv/channel/eblack-champaign-urbana A workshop will be held on-site to help interested individuals with e-mail, facebook, the eBlackCU digital library, and digitization of photographs, scrapbooks and personal and community history collections. Come to digitize your material and go away with A FREE CD of your digitized material. IF YOU INTEND TO BRING LARGE ITEMS TO THE WORKSHOP WE RECOMMEND E-MAILING US AHEAD OF TIME at nlenstr2@illinois.edu so that we ensure we can meet your needs. Come to this meeting to find out how individuals and groups in our community have mobilized to get out of UC2B (http://www.uc2b.net/) the following community benefit resolution. Find out how YOU CAN PLAY A PART in making sure the community gets everything it can out of this $30 million dollar high-speed broadband network. Community Benefit Resolution Passed by UC2B Policy Committee, April 20, 2011: 1. The Policy Committee (of UC2B) will issue an annual public report on the digital divide in the UC2B service area (the area of the seven rings including all of Urbana, Champaign, and Savoy). 2. The Policy Committee will convene an annual meeting of anchor social institutions to discuss the above report and set general goals for overcoming the digital divide. This meeting will be open to the public, and be scheduled as a regular meeting of all UC2B committees. 3. At the end of each fiscal year, unless UC2B has operated at a deficit that year, the Policy Committee will allocate at least 5% of its annual revenue to a community benefit fund as a line item in the budget. Money from this fund will be dedicated to overcoming the digital divide, according to the general goals as above and the process as below. 4. The Advisory Committee for Digital Equality will develop and carry out a plan, including competitive grant awards from the community benefit fund to non‐governmental agencies, to implement the general goals as above. If there is no available money in any given year, no grants will be made. The Advisory Committee will forward to the Policy Committee its recommendations for spendingthe community benefit fund, and the Policy Committee will make the final decision. Light refreshments will be served. Share this invite with your friends. Noah Lenstra, “Community Technology in Champaign-Urbana Flyer and Announcement,” eBlack Champaign-Urbana, accessed April 23, 2019, http://eblackcu.net/portal/items/show/1195.